I dumped the luxuries from my hold. 2cr loss per unit, but they'll only slow me down in battle. We dashed to the hangar, refuelled and jumped into the Antaren battlefront. From the hyperspace exit nothing looked amiss. No ships at all were coming up on the scanner, only a deserted planet sweeping nearby called "Hell". Nice touch. We plotted course for Eif, the Faeyan controlled planet that controlled the sector. 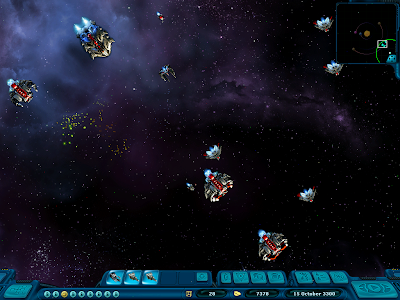 Approaching Eif, the remnants of battle were strewn though space. 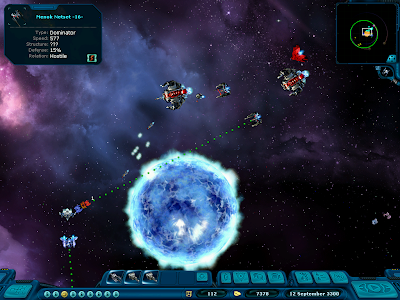 Dominator ships were now visible attacking a pirate base in the sector, and only 2 system-bound battleships remained. 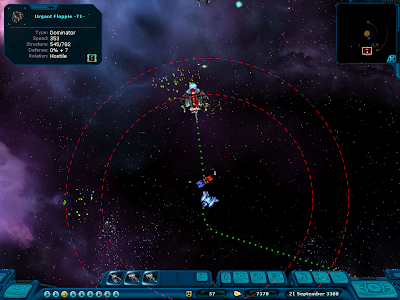 The pirate base lasted a heartbeat longer before imploding with torpedo fire. The Dominators now turned their attention back to the planets .. and us! With a larger fleet, a faster fleet, and a more deadly fleet, now was probably the time for retreat. It would be nice to drop one though, I'm pumped for some action. Omallor and I headed back toward the jump point. Only one has us locked on, so maybe it will be a more even dogfight. Who knows, maybe we can give them the runaround until more support arrives? 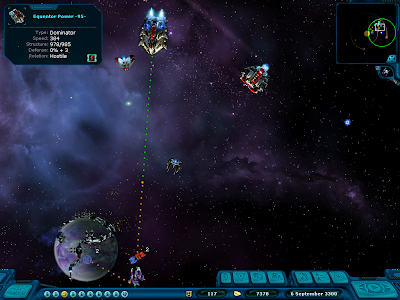 The battleships retreated planetside to leave us the only ships in the dominators path. Luckily the Neutron star was between us and the main fleet as we tried to outrun the torpedoes. 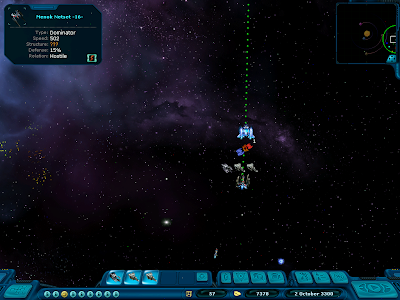 Omallor was copping the brunt of the attack, so I ordered him back to "Glove", the human colony of Antares. I tried to make it to some debris of a previous battle to grab at least some spoils of war. With a faster ship and the Rethone working to slow it down even more, I had the scrim under control, but another Dominator joined the fight to make things interesting. Unfortunately my scanners can't penetrate his shields to figure out how much I'm damaging him, but the repair droids are going flat out and keeping me stable with half my hull gone. A few torpedoes got through from the original larger ship to slowly knock more of my hull away to 1/3, but luckily a trader gated in close by and drew away his attention. I'm way out past the gate points now, but it's only me and the one designated as "Menok Netset -16-" out here. It must be getting damaged as there's visible signs of damage in the rear view mirror and it's been leaking nodes for a while. Might be a tight race. Got'im yes! Got down to 63 hull remaining, but the repair droids won the battle. I'd turned around to get a head start on picking up the nodes it was jettisoning. Lucky too, as the Rangers holding the main fleet's attention had vanished (no messages on their demise, so I'm guessing they are repairing on planet). A different variant with torpedoes led the pack and had caught up to me by the time I'd repaired 1/2 my hull back. With the rest of the fleet hot on my tail it's probably a good time to jump out of here. I've got my kill, but it wasn't worth losing a wingman for.